On January 25, around 14 children were on the bus when the kidnappers blocked it in east Delhi's Dilshad Gardens. 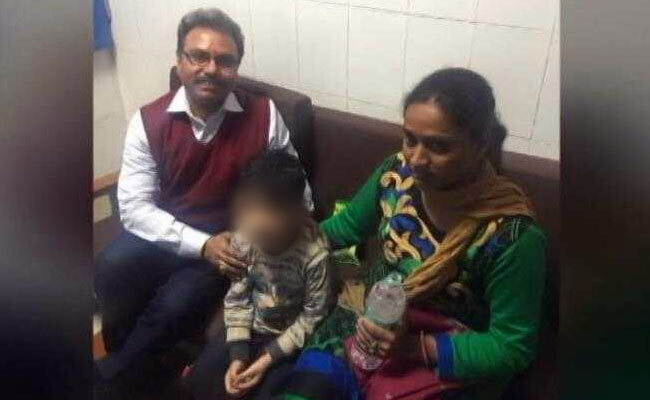 A five-year-old boy kidnapped in east Delhi last month from a school van full of children has been rescued by the police after a late-night shootout with the abductors in Sahibabad, about 40 km from the national capital. The nursery student was kidnapped on January 25 by two armed bikers who climbed aboard the van and shot at the driver. The police tracked down the kidnappers to Sahibabad near Ghaziabad in Uttar Pradesh and shot dead one of them after a 30 minute shootout. They have arrested two others who were injured in the gunfight. Crime branch official of the Delhi Police raided the fifth floor apartment at about 1 am. A video from the shooting site showed blood on the floor of the flat and bullet marks in the netting of a door. The child, police sources said, was kept in this apartment for over 10 days. The police had been on the kidnappers' trail for the last 10 days. They got a lead when the captors called the parents on January 28 and demanded Rs. 50 lakh ransom. The police handed over the child to the family early this morning. The child's grandfather thanked the police and said the entire family rushed to the GTB Nagar as soon as they were informed about the 5-year-old's rescue. On January 25, around 14 children were on the bus when the kidnappers blocked it in east Delhi's Dilshad Gardens. The driver had stopped to pick up a student. A black bike with two men pulled up alongside. The bikers, their faces obscured by helmets, held a gun to the driver's head and threatened to shoot if anybody raised an alarm. While one man kept the driver rooted at gunpoint, the other grabbed the five-year-old child. The boy's sister, who is in Class 3, tried to hold on to him but couldn't, say sources. When the driver tried to stop them, the men shot him in the leg and ran away with the child. The brazen kidnapping by armed men had left the city in shock, especially since it happened at a time there was tight security in the capital for the Republic Day celebration as well as the ASEAN summit, for which 10 world leaders were in Delhi.